Billie Joe Armsrtong's guitar tech mentions that Billie uses an SH-4, Aka, the Seymour Duncan JB. Scott mentions the Seymour Duncan JB at 1:18. "It seems that Kurt sometimes used Seymour Duncan Hot Rails pickups, which are humbuckers, but reduced to the size of a single coil pickup, meaning they could be fitted to his Fenders with little or no irreversible damage. In guitars that could fit them, he often used Seymour Duncan JB pickups. " This is Zacky's bridge pickup. "**Interviewer:** *Why did you change out your stock pickups? * **Bouillet:** 'One reason is for live touring. I like to have some of my guitars matched as far as output and response. Another reason is that I’ve had the luxury of trying different pickups in the same guitar through the same amp. And the [JBs](https://www.seymourduncan.com/pickup/jb) were always one of the best sounding. I have stayed with [JBs](https://www.seymourduncan.com/pickup/jb) in my main two guitars. A 1978 Les Paul Standard, and a 1978 Ibanez pf300. The sound of my [JBs](https://www.seymourduncan.com/pickup/jb) are smooth and even, with a solid output. Not too fuzzy or scooped.'" "I have another [Les Paul Standard](http://equipboard.com/items/gibson-les-paul-standard-electric-guitar) which is probably from ’93 and it has a Seymour Duncan JB (SH-4) in the bridge position and the neck pickup is whatever came on the guitar." - [Ray Toro](http://www.seymourduncan.com/blog/artist-interview/ray-toro-of-my-chemical-romance/). According to http://www.seymourduncan.com/ Tom Morello uses as Seymour Ducnan JB in his gutiars. As mentioned on this website. According to the Seymour Duncan website. Ler has used a Seymour Duncan JB in one of his guitars. it's unknown when he used the pickup. According the Seymour Duncan Website, Phil uses an Seymour Duncan SH-4 JB. 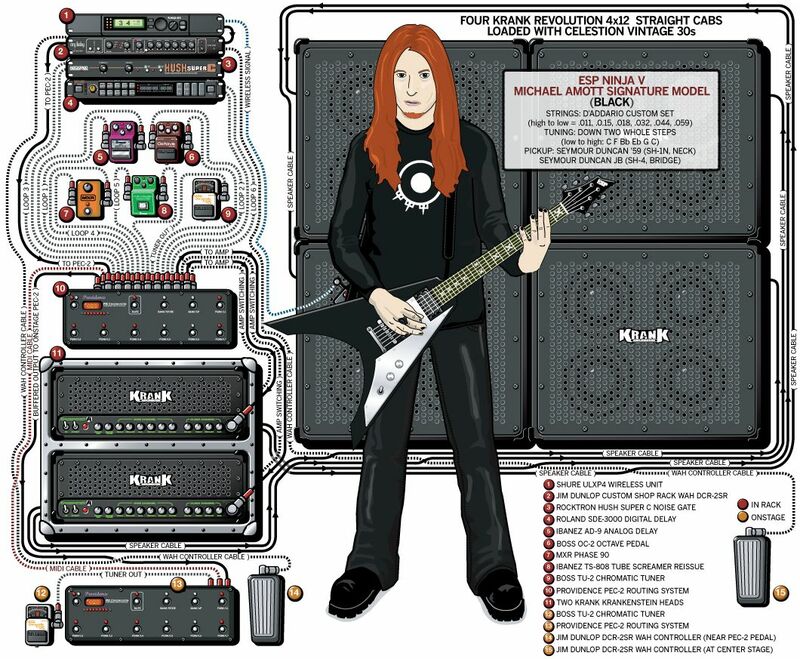 This gear diagram of Michael's stage setup, lists a Seymour Duncan SH-4 JB. 1:23 he states "i threw Seymour Duncan's in there"
In this video, Ian D'Sa mentions he modded his American Deluxe strats with the JB humbucker in the bridge. In this interview at 3:29, Richard claims his ESP 901, which was the original guitar he used for the first 2 Rammstein albums, had an "SH-4" pickup, most likely referencing the Seymour Duncan SH-4 JB. "I’m using the LTD EC-401. I like having a thicker-bodied guitar. I’m using them with Seymour Duncan JB pickups." In this rig rundown for premier guitar, alan states that he has duncan jb pickups in the bridge of some of his guitars. At 12:14, Dan explains that the guitar has a Seymour Duncan JB humbucker in the bridge and a Seymour Duncan Phat Cat in the neck. He is known to use this in many of his guitars. 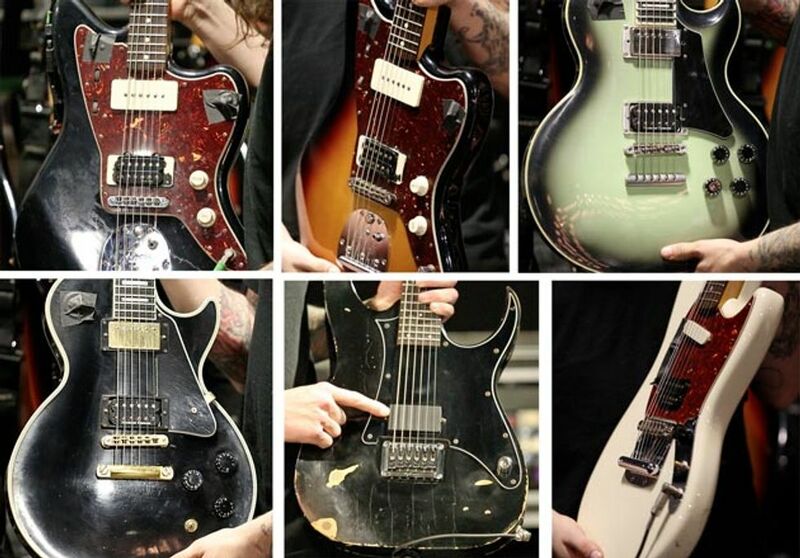 "DePoyster’s main guitars are a pair of modified MIM Fender Jazzmasters, both equipped with a Seymour Duncan JB humbucker in the bridge position and an unused, stock neck pickup," states Premier Guitar's [rig rundown](http://www.premierguitar.com/articles/20659-rig-rundown-the-devil-wears-prada). "i put in a seymour duncan JB in the bridge"
Throughout this video Rob shows us the difference between the SH-4 JB Humbucker and [TB-11 Custom Custom Trembucker](http://equipboard.com/items/seymour-duncan-tb-11-custom-custom-trembucker-pickup) pickups. Tim ripps the stock pickups out of every guitar, mostly SGs and Les Pauls, and puts in a Seymour Duncan SH-4 JB bridge pickup and covers the empty neck pickup rout with black tape. Christian Martucci is endorsed by Seymour Duncan and one of his mentioned gear was the SD JB. He uses this on most of his partscasters. This is the neck pickup in his walnut Omega, mentioned in article. Both guitarists in Boris use Seymour Duncan pickups; a JB in the bridge position, and a '59 in the neck position. (The following is translated from Japanese) "JB (bridge) is located on the bottom left with... '59 (neck) ~. T [bassist/guitarist Takeshi]"
Sebastien used a Seymour Duncan JB for his bridge pickup by the time of Get Your Heart On recording. Syu is known to be an artist who uses both Seymour Duncan and EMG pickups. A majority of Syu's signature guitars that are equipped with passive pickups have a JB pickup on the bridge. Floyd Rose variants are equipped with a trembucker, while the Classic and Rebel models are equipped with the SH-4. Tymon is the guitar player and composer for Dutch fusionmetal band Exivious. He played in respected US prog band Cynic from 2007 until 2011. Overall great pickup, slightly hot and can be shrilly if set to high up. If you get the right setup its a great pickup overall and can cut through. Its the most popular aftermarket pickup for a reason. Does classic rock very well. Cuts through nicely. With the JB, you can't go wrong... Jazz, Rock, Blues, Metal..... the list goes on, it works superbly for all genres, the ultimate pickup, as far as I'm concerned. I use this for the bridge position in my Fender Kurt Cobain Road Worn Jaguar and the bridge position in the Yamaha Revstar. I must say this pickup is very versatile, no regrets. I can play whatever I want with this pickup. Even you have it in crappy guitar, it still sounds good.